And here they are. TechCentral’s top five newsmakers of 2011. Our “Newsmakers of the Year” award is presented to individuals we believe had the biggest impact on SA’s technology sector in the past 12 months. For the most part, they’re also the the people who made the headlines during the year. If you missed part one, check it out here. And check out our top-five international newsmakers, too. First National Bank CEO Michael Jordaan has to be the best known banker in SA, thanks to his presence on social media networks. Indeed, on his watch, the financial services institution is making waves because of its aggressive digital strategy that seeks to reduce the amount of time its clients spend in physical branches. An active Twitter user armed with a sharp wit, Jordaan’s visibility on the micro-blogging platform has helped turned FNB’s image from that of “just another bank” to a warmer and more personable brand that engages directly with its customers and knows how to get in a good dig against its rivals when the opportunities present themselves. Smartphone apps, discounted phones and tablets and free fixed-line broadband are some of the digital tools it’s using to entice consumers. Despite promising noises during his brief tenure as minister of communications, President Jacob Zuma removed Padayachie from the post in October in a cabinet reshuffle, sending him to the public service & administration portfolio instead. Although some regarded Padayachie as good at PR and little else, most agree his abrupt redeployment could further delay crucial projects like broadcast digital migration. Though he may not have achieved as much as the telecommunications sector would have liked him to in his time in office, he certainly kept making the right noises and actively engaging with industry players. Padayachie was reportedly an active supporter of KT Corp’s bid to acquire 20% of Telkom, a move that enjoys broad support (outside the unions). The Telkom Group CEO has been at the helm since April, but already she’s managed to make quite an impression. Moholi inherited a company in trouble, but appears to have been doing a good job of shifting the company’s strategy, keeping a lid on the political infighting that has plagued it in the past and generally trying to steer the ship on a new course. With a strong chairman at her side in the form of Lazarus Zim, Moholi has made it clear she intends to play to the company’s strengths — its extensive market share and fixed-line dominance, which, if coupled with services like video on demand, could give it a strong competitive advantage. She faces an uphill battle, though. Competition is intensifying rapidly, there’s constant pressure from trade unions, and regulatory scrutiny — from both the Independent Communications Authority of SA and the competition authorities — is growing. The MTN SA MD launched SA’s first large-scale long-term evolution (LTE) trial, demonstrating speeds previously unheard of in SA telecoms. Pienaar is a fierce advocate of LTE and has said that if MTN had the spectrum it needs, it would roll out a national LTE network tomorrow. 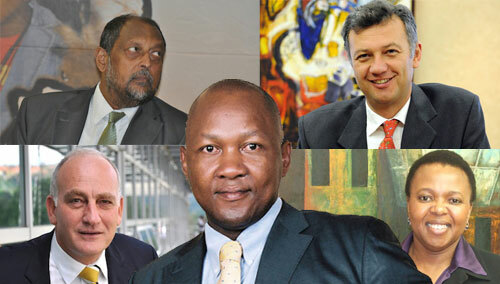 TechCentral’s SA Newsmaker of the Year had an eventful 2011: through his Convergence Partners investment vehicle, Ngcaba launched a US$250m satellite with Intelsat (after a false start) and signed a multibillion-rand deal to build a national fibre network with Cell C and Dimension Data’s Internet Solutions. A former Umkhonto we Sizwe commander and later senior government bureaucrat, Ngcaba has taken to the business world like a proverbial duck to water. Executive chairman of Dimension Data Middle East and Africa, in which he also holds a sizeable investment through Convergence Partners, Ngcaba is certainly prepared to put his money where his mouth is.